As for stitching, I didn’t even get out of my PJ’s on Monday, so did a bit of stitching instead to try to keep my eyelids open … I started Santa’s Stash by Full Circle Designs, as part of the Ornament challenge/SAL on the Welcome Friends BB. But I forgot to pack the Mill Hill beads, and needed to buy some buttons and two of the DMC colours before I could finish it, so Mum and I popped out to Spotlight on Tuesday, and by midnight Tuesday night the final stitches were put into place. 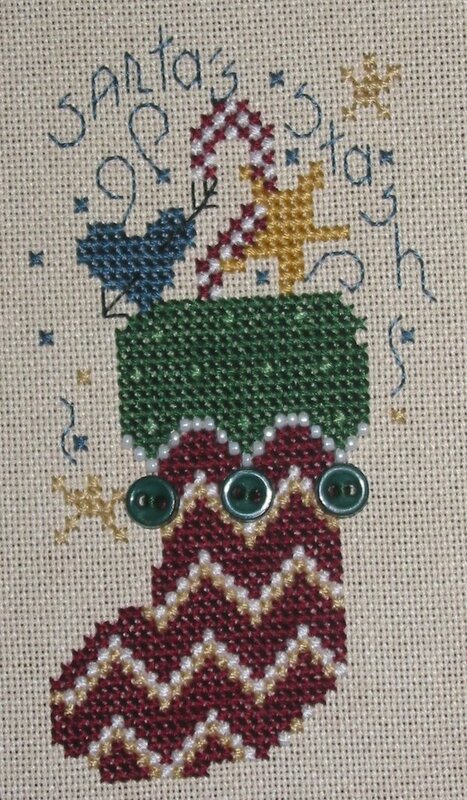 Anne S • This entry was posted in Christmas Ornaments, Cross Stitch, Exchanges, Finishes and tagged Christmas Ornaments, Cross Stitch, Exchanges. Bookmark the permalink. Great to hear that your Mum has started stitching, and that you’re enjoying your time in NZ. It’s so exciting that your mom has started cross stitching! Gosh, I’d fall right over if my mom decided to try it out! Sorry about your stress levels with your dad – hope the rest of your stay is a lot more relaxing!! The fob is really beautiful. What a beautiful fob you have received. I still have stuff at my parents and I left home in 1997. I don’t think I ever really ‘left’ home. Mum said to me the other day, when I was looking through some things and deciding whether, under the circumstances, it was best just to leave them at home, that I must have known somewhere in the back of my mind that one day something wouldn’t work out and I would rather not have my valuables and family heirlooms wherever I was at the time. It’s true, I parcelled up a couple of things before I left to go on holiday, to take to my parents. Family china that I do not want my ex getting hold of. Even 90% of my jewellery still lives at home.